He is coming so for good or bad, hopefully more of the good, strap yourself in for more fun. We said Suarez couldn't be replaced and at least in the fun category Super Mario can replace him, his record also shows that he could replace him in the goals category and almost certainly in the getting In the papers and causing problems category as well so for me, just the assists missing, not a bad attempt at a replacement and for only £16 million very good business. I know, sweeping generalisations but only said partly tongue in cheek. Firstly the obvious, he comes with baggage and I think we need to accept this as part of who he is, we have a manager who can work with this type of personality, we have Steve Peters who in my opinion helped Suarez immeasurably, we will see how things go at Barcelona in this regard and also, we have, we are told, assurances written in to a contract regarding behaviour, all should help with controlling the dark side. Liverpool are in my opinion a club and a team who can bring out the very best in Balotelli as we did with Suarez and are doing with Sterling and the best of Balotelli is very, very good. Goals haven't been a problem throughout his career figures show that at all his clubs he has scored even when used from the bench or played slightly out of position as at Manchester City. No matter what he as scored at an average of a goal every two games even whilst playing in a struggling team in Milan, his shots on target ratio is just below 50% again excellent when you consider the shots he takes on, not just your close range efforts for Mario. He scores from all over and all types of goals. Physically Mario has everything Suarez had and possibly even more, he is big 6'2'', very strong and very fast, an imposing figure that will cause fear in any defence. His strength and power will provide Liverpool with something that they have been missing in the past and certainly a further option in their ever increasing attacking arsenal. Strong in the air and on the floor many would claim that he is the all round striker with all the physical attributes to get even better and at only twenty four plenty of time to grow and develop. Teamwork is not a strong point and this shows up in perhaps the biggest disappointment in Balotelli's game, the lack of assists, not something usually provided by your top striker, with finishing being the most important attribute but Suarez created bucket loads and you would hope a replacement would at least be able to chip in with a few assists. 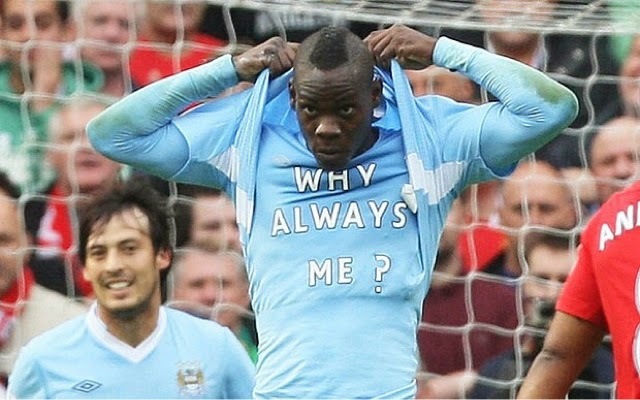 This is where Balotelli needs to improve. He has a reputation for sulking on the pitch, not being a team player and as a result, on occasion, not having a high enough work rate. All of these resulting, in my opinion, in the shortage of chances created for others. As I have stated earlier I believe we have the people in place to change him and persuade him to be more of a team player Rodgers and Gerrard will certainly not put up with a poor work rate and sulking. If the work rate increases so will the numbers of assists. Sturridge was said to be at his last chance at a big club when he joined Liverpool and nobody can complain about how things are turning out there, repeating the trick with Balotelli is all that's required. Overall we said Suarez couldn't be replace by an individual, last season he was the best player in the world and you can't replace that, but in Mario Balotelli I believe we have come close, he will provide goals, he will provide a presence on the field, he will provide excitement, he will provide the fun, he will, probably provide the controversy, and all without breaking the bank. Balotelli is young enough to be able to grow hopefully learning to control the dark side and bringing more of the excitement and one day could even reach the levels of Suarez, let's hope so and while we wait let's just enjoy the enigma that is Mario Balotelli.